When you hear the phrase “rekindle the romance” what comes to mind? A quiet candlelight dinner? A dozen red roses beaming from a vase? Or a long moonlit walk along a beach? For us, we think of sipping heavenly wines, exploring crumbling castles, soaking in breath-stealing mountain views and more wine. Always more wine. Luckily, such a place exists. And we didn’t have to suffer a romance novel to experience it. “Your direct flight to Munich has been canceled,” said the woman behind the ticket counter who wore a face way too cheery for such news this early in the morning. The words hit us like a hangover. “We can fly you to Copenhagen and then connect you to Munich from there,” she said as if the two cities were only blocks apart. “Okay, guess that will have to work,” we fired back. A first world problem of this magnitude was not about to spoil our mood. Of course, we knew right then this airline snafu would most certainly result in lost luggage. And sure enough, it did. When we finally reached Munich, we sat at the baggage carousel like puppies waiting for a promised treat, but our second bag never arrived. Two first world problems in one day. Only a bottle of wine was going to ease this hurt. If you have never walked through a vineyard in the early morning light, make a point to add it to your South Tyrol bucket list. Watching mist lift off a canopy of vines as the sunlight streaks across the mountain tops detoxifies the mind unlike anything else. Fortunately for us, we were bound for a destination where wine would not be in short supply. We hopped in our rental car and zoomed through Bavaria, the Brenner Pass ultimately arriving in Eppan (Appiano), South Tyrol. Only a mere 7 hours later than originally planned. 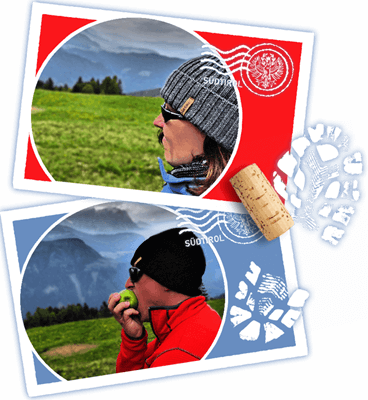 Nevertheless, our hearts sang with glee to be in the heart of South Tyrol’s most celebrated wine region. Eppan is a quaint village along the South Tyrolean Wine Road. This lush area rolls with Mediterranean bliss from one hill to the next. Stately manors sit amidst vast vineyards and orchards — painting a romantic scene that would make even Casanova gush. It was late into the evening as we turned up the road toward Donà Winery (officially Weingut Donà in German), a family-owned wine estate and villa offering guests a chance to relax in the middle of vineyards while enjoying the company of the Dolomites in the distance. Since night had fallen, we were thankful to have grape vines guiding us until reaching the villa parking lot. While getting out of our car, we spotted a structure high up on the mountain cast under a glow of lights. What historic haunt could possibly be sitting up there we wondered? Our apartment was immediately inviting. 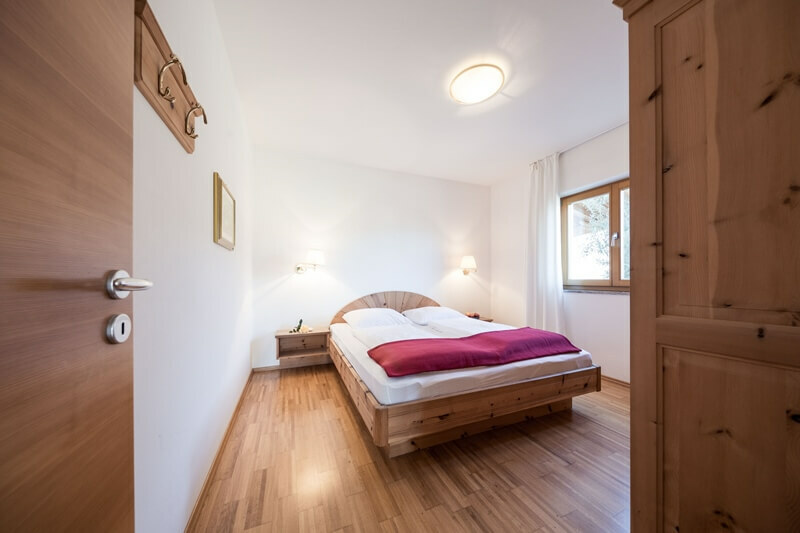 Warm alpine wood accents complemented a modern, minimalist style. This gave it a spacious yet cozy look we appreciated. We fell in love with a charming dining nook tucked into the corner of the kitchen by a window. The thought of awakening there in the morning with a cup of coffee while admiring treasures out the window was enticing. But first, we needed some serious rest. We both collapsed into bed and let the weight of traveling much longer than anticipated carry us into a deep sleep. Weingut Donà puts you in the heart of South Tyrolean wine country with epic views of the majestic Dolomites. Morning seemed to arrive in a blink. The winery’s position on a hill allowed the dawning sun to pour into the apartment. We welcomed every glorious ray. A balcony off the living room provided the first daylight peek of our surroundings. Grape vines encircled us. In the distance, glistening like stone angels beyond the rooftops of Bolzano, stood the snow-blessed peaks of the Dolomites. But the breathtaking views did not end there. The Texel Group of mountains beckoned with splendor north of Lana and Merano. The sun washed over the winery revealing an Italian-style villa with the swooning romantic allure one finds in a painting. Storming upward directly behind it was the Mendola mountain range with a castle gripping its edge. The look of awe on our faces must have been rather obvious as we were soon greeted with a knowing smile by Martina Waldner Donà, the owner of Weingut Donà. She warmly introduced herself and informed us the castle was called “Hocheppan”. We were somewhat familiar with this medieval fortress as we knew its 13th-century chapel held the earliest known fresco depicting a man eating one of our favorite Tyrolean dishes: knödel (dumplings). Of course, we had to know if the castle was accessible. Martina indicated it certainly was by foot, but that the interior was closed for the season. 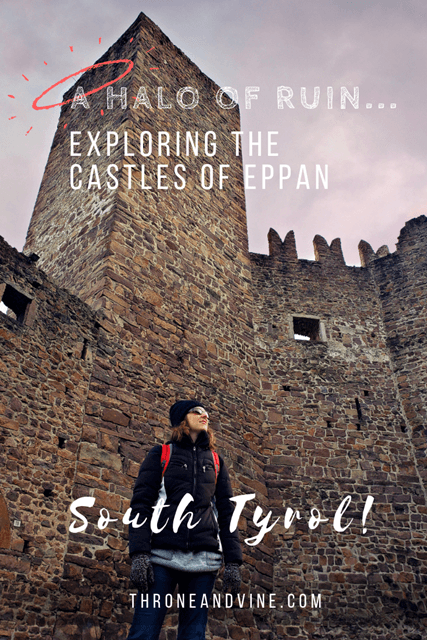 Since a good hike is always on our mind in South Tyrol, we decided a trek to Castle Hocheppan was a must. Even if we couldn’t plant our behinds in its throne, seeing it up close would still be unforgettable. 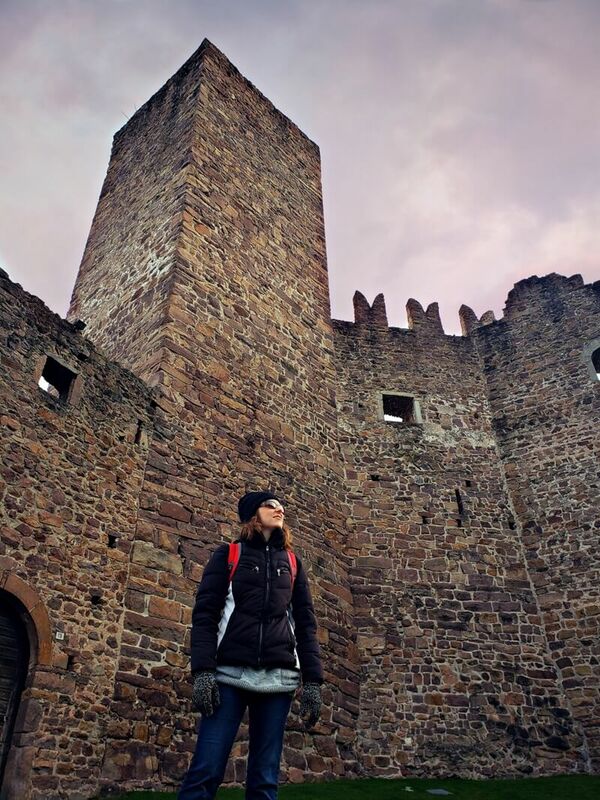 Kate admiring the centuries-old Hocheppan Castle high above Weingut Donà. Martina shared a bit more about the area and cordially checked to see if the apartment met our expectations. Her passion for exceptional service and bubbly personality made us feel right at home immediately. Before heading back inside to get ready for a day trip to Bolzano, we scheduled a winery tour and tasting with Martina the day after our castle hike. Hiking up a mountain the same day as a wine tasting did not seem wise. Castle hunting in South Tyrol demands steady legs. The morning after our castle hike was just as gorgeous as the previous two. We savored the sunlight pouring in again while nibbling on fresh Schüttelbrot that Martina graciously left us the day before. Schüttelbrot is an Alpine-spiced rye flatbread that is a crispy treat common in South Tyrol. Staring deep into Lagrein is almost as hypnotic as sipping it. In the glass, Donà's Lagrein dazzled with a dark ruby color. In the mouth, it tantalized with notes of black cherry. Afterward, a stroll through the vineyard just outside our door was too tempting to pass up. If you have never walked through a vineyard in the early morning light, make a point to add it to your South Tyrol bucket list. Watching mist lift off a canopy of vines as the sunlight streaks across the mountain tops detoxifies the mind unlike anything else. Martina eventually greeted us with a bag of freshly picked apples from one of Weingut Donà’s orchards. Their juiciness looked enticing, but sinking our teeth in one had to wait as we were anxious to sip some wine. She led us below the villa to a boutique wine operation and cellar. 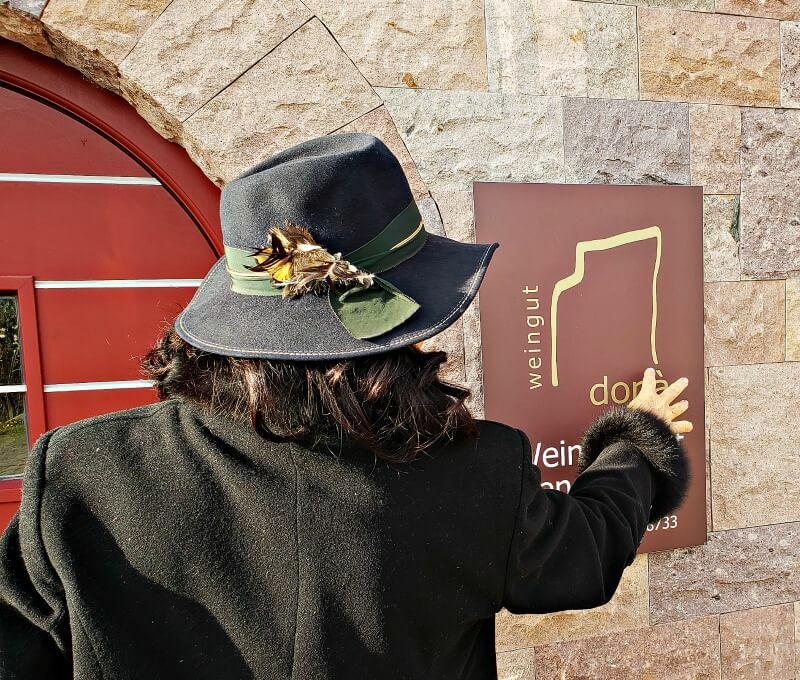 Martina points out the significance of the mountain silhouette on the Weingut Donà logo. We discovered Weingut Donà is a family-run winery built by Martina and her husband, Hansjörg, who spent several years working as a winemaker for other respected wineries in the region. 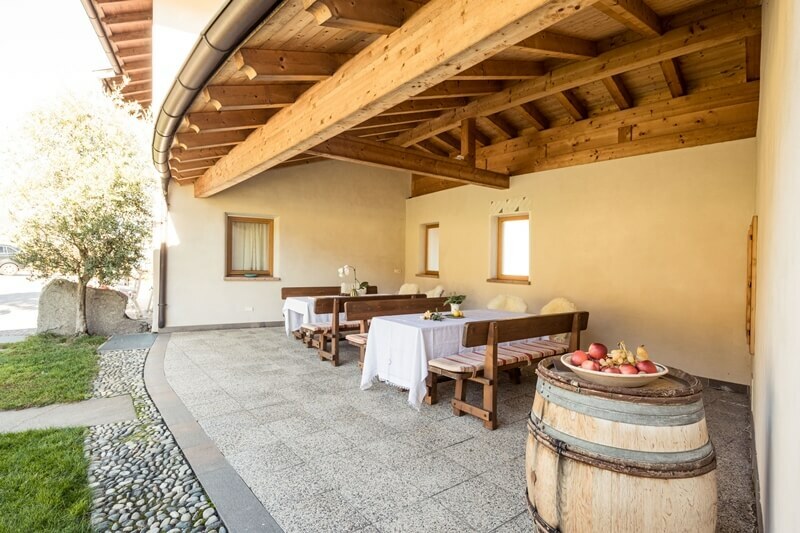 Combining skills and passions, they brought to life their vision of producing fine wines within a setting where guests can immerse themselves in South Tyrol’s unique wine culture. The family’s winemaking principles center around sustainability and high quality. A long-term approach guides everything they do. The right touch of state-of-art technology along with careful cultivation by hand ensures Weingut Donà produces only the best wines. 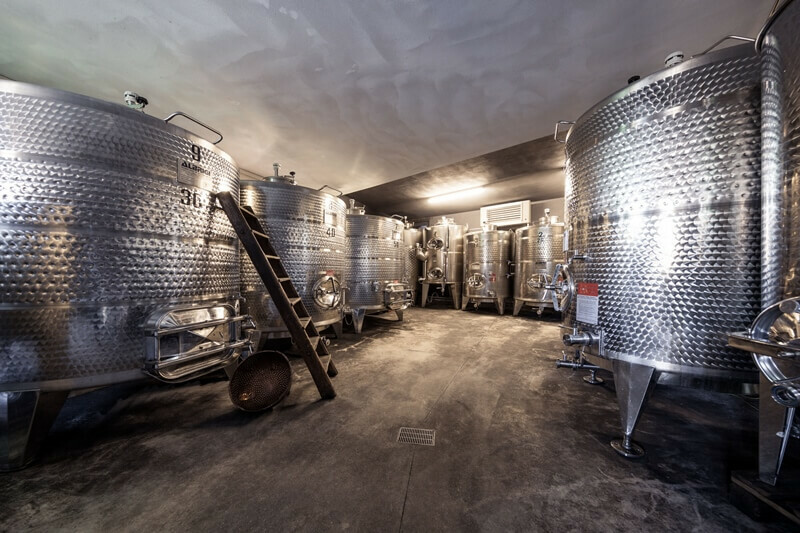 A handful of stainless steel fermentation tanks at the winery produce a remarkable amount of reds and whites — 30,000 bottles each year. From the fermentation area, Martina led us to an enchanting tasting room lined with French oak barrels, which the winery uses to mature its wines. She informed us nearly 4 hectares of vineyards surround the winery. Donà also relies on grapes from a vineyard in Dorf Tirol to produce its award-winning Sauvignon Blanc. Other Donà varietals include Chardonnay, Vernatsch, Lagrein and Merlot. Hotels and restaurants in South Tyrol purchase the majority of its wines, but guests can purchase them as well. We began our tasting with Weingut Donà’s Terlaner Chardonnay. Typically, we skip over Chardonnays when at a wine shop, but the Chardonnay from Weingut Donà was a masterpiece. It was nicely balanced. Both crisp and lush imparting hints of green-apple flavors. Next, Martina poured their Vernatsch (also known as Schiava). This varietal has really grown on us during our time in South Tyrol. The Vernatsch was as delicious as any we have tried. Martina indicated that after 5 years of producing it, Weingut Donà won the top award for Vernatsch in Italy. We could easily see ourselves drinking it at any time of year. We followed the Vernatsch with Weingut Donà’s Lagrein. Staring deep into Lagrein is almost as hypnotic as sipping it. In the glass, Donà’s Lagrein dazzled with a dark ruby color. In the mouth, it tantalized with notes of black cherry. Lagrein always pleasantly surprises as it is lighter than its color would indicate. Our final wine was a Lagrein Merlot blend. This beauty was new to us. 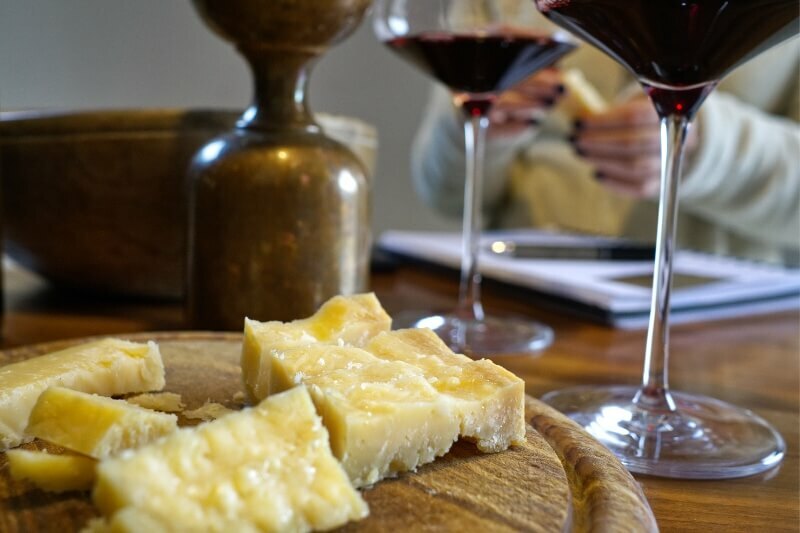 Martina paired the wine with a hard Parmesan-like cheese from Mila — a local dairy producer that creates authentic Alpine flavors by using milk only from South Tyrol cows. We consider South Tyrolean milk the best in the world so naturally, every bite was a delight. Martina took us on a grand journey through her family’s world-class wines. The Lagrein Merlot itself was excellent. The Merlot lent a more bold character that danced with subtle fruit flavors. With a big smile, Martina made our sample a full pour and we all toasted to an exquisite tasting. It was a true joy to spend time with her and learn more about the family business and South Tyrolean wines. After the tasting, Martina gave us a tour of the largest apartment at Weingut Donà. The villa apartment sleeps 6 making it an ideal escape for a family or group of friends. A bachelorette weekend or girls getaway here would be one to remember. 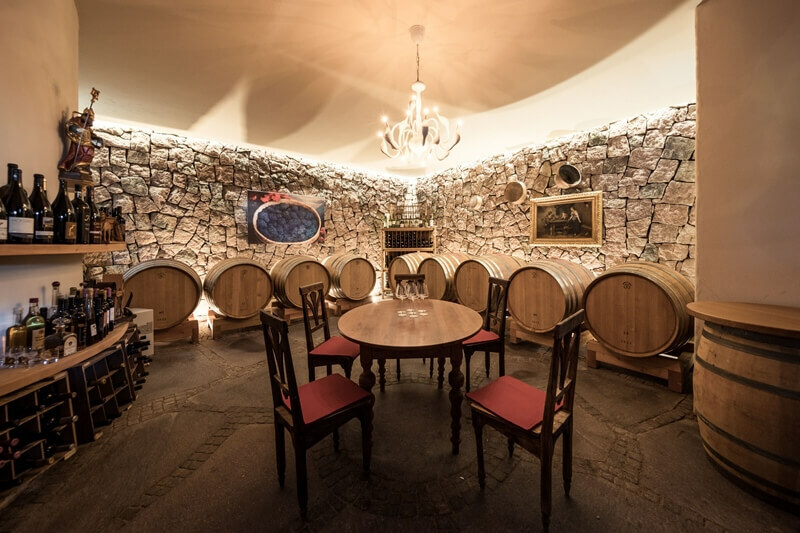 Weingut Donà offers the perfect mix of world wine adventure with the cosmopolitan charm of Bolzano just minutes away. We could not imagine a better way to ease into our adventures in the Dolomites than staying at Weingut Donà. Before moving onto our next day trip to Merano, Martina gave us a restaurant recommendation in nearby Lana. She even called the owner to make sure a table would be available. Then she invited us to park our car at the family’s additional holiday apartments in town where we connected with her daughter, Franziska. This level of service was not expected but was also not surprising given her kind nature. After a 15-minute car ride, we arrived in Lana and met Franziska. She was just as gracious as her mother, spending time with us to make sure we had a good understanding of how to find the restaurant and other key sights in Lana. 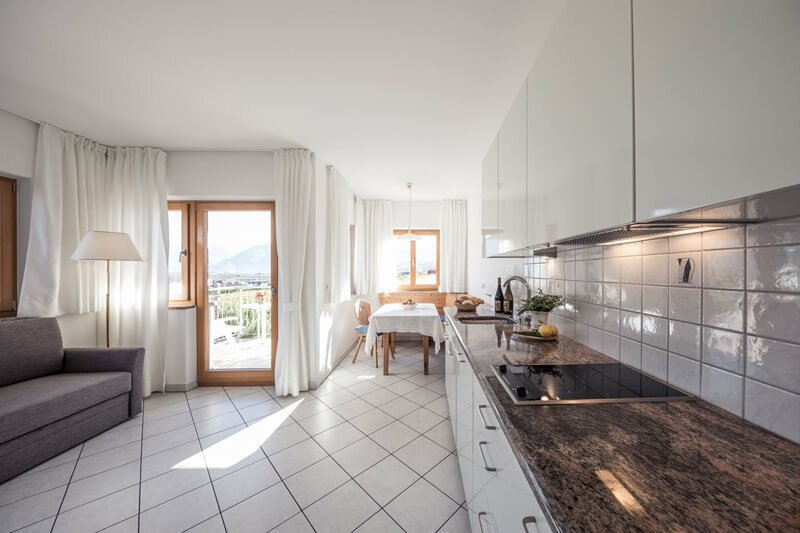 We learned the Donà family offers 12 apartments located in the heart of this mountainside town. Before darting off to the restaurant, we strolled the cobblestone streets of Lana for a bit. A shop called LAiMER caught our eye. Its window display showcased watches and glasses unlike any we had ever seen. We popped in for a quick visit and discovered this South Tyrolean company crafts all of its products with wood. The designs were exquisite. Forty euros later Kate walked out with a sleek wood bracelet. The 1477 Reichhalter restaurant in Lana offers a traditional cuisine that you’ll dream about long after your last bite. By the time we arrived at the restaurant, 1477 Reichhalter, we were craving a serious meal. Funny how wine before lunch tends to do that. We sat in a small dining room resembling an old farmhouse inn. 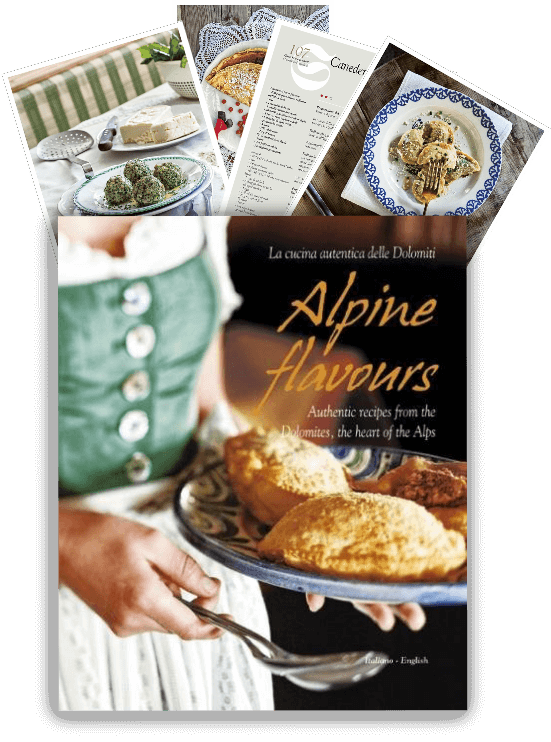 Despite the traditional country ambiance, our hunger talked us into splitting the meals between Italian and South Tyrolean. Both were more than satisfying. If it wasn’t for being full, we just might have immediately reordered a second round of the dishes. 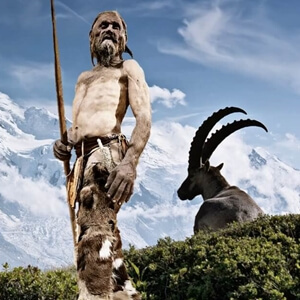 The following morning we departed the winery for our stay right below the Schlern / Sciliar massif — the Dolomite giant known as Witches’ Mountain which we long admired from our balcony. We could not imagine a better way to ease into our adventures in the Dolomites than staying at Weingut Donà. 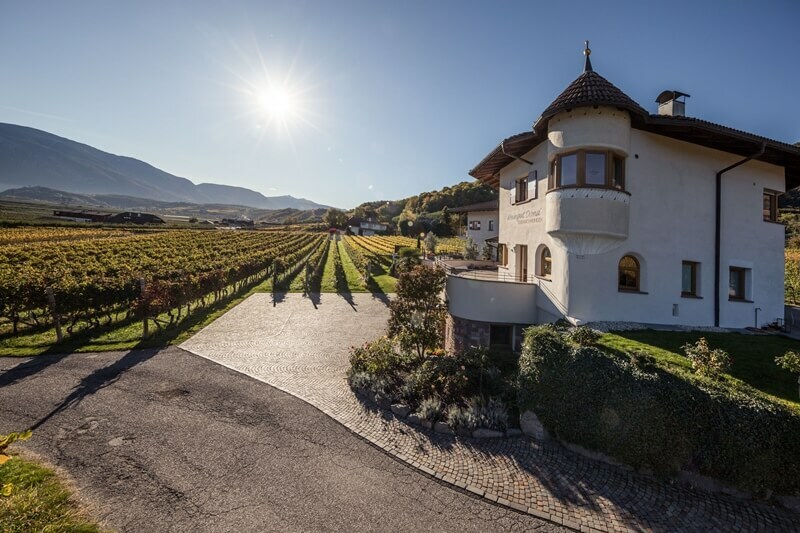 Even for those not fans of wine, the villa’s location is among the best to embark on the Three Castles Walk, as well as explore much of South Tyrol’s diverse landscapes and cultural offerings. And in case you’re still wondering if we ever received our 2nd bag from the airline. The answer is a resounding yes. The bag magically showed up a couple of days into our stay. Martina kindly placed it inside the apartment for us. If you’re interested in staying in Eppan along the South Tyrolean Wine Road, we recommend contacting Weingut Donà directly. The value you will receive at the rates they charge is exceptional. Additional photos of Weingut Donà credited to Florian Andergassen.